1 photograph : b&w ; 17 x 23 in. Item is a copy of three composite photographs of sections A-C of the Dalhousie Faculty of Law in 1982-1983. The photographs consists of portraits of Glenn Anderson; Debbie Armour; Sonya Brander; Barbara Brown; Jim Burrill; Bernard Butler; Edwin Cameron; Bruce Chislett; Greg Clark; Lynn Connors; George Donovan; Doug Drysdale; Allen Eagleson; Neil Flanagan; Celia Forsyth; Mary Hamilton; Charlotte Hatfield; Peter Hickman; Jean Hillier Dewolfe; Richard Hirsch; Ian Holloway; Jim Isnor; Cathy Jones; Shawn Kavanagh; Bruce Langstroth; Greg Lenethan; Hester Lessard; Gerald MacDonald; Fraser MacFayden; Marguerite MacNeil; Barry MacTavish; Frank Archibald McIntyre; Isobel McNeil; Kirk Meldrum; Evangelia Moutoulas; Holly Nicholson; Cathleen O'Grady; John Oxner; Dave Parker; Rick Pellino; Deborah Poole; Harold Porter; Don Presse; Kay Rhodenizer; Peter Rosinski; Catherine Smith; Ron Snyder; Roberta Sullivan; Greg Uhrynuk; Clayton Wallace; Gary Wharton; Randy Whiffen; Liz Wood; Gita Anand; Heather Boyd; Nan Brooks; Darrell Brown; Sheila Bruce; Ross Byrne; Brent Childs; Ronald Chisholm; Brenda Christen; Roy Dickey; Joan Dornian; Robert Dunn; Kevin Gault; Edward Gores; Duncan Gosnell; Pam Goulding; Isabel Grant; Bernie Hogan; Cheryl Holden; Jim Igloliorte; Joanne Johnston; Jawad Kassab; Karen Kinley; Annemarie Koch; David Kornhauser; Eric LeDrew; Jud Levinson; Kirk Lyonde; Jim MacAulay; Kevin MacLean; Brian MacNeil; Peter McElahney; Janet McMurtry; John Meaney; Valerie Miller; Judy Neil; Karen Oldfield; Jon O'Neill; Scott Peacock; Brenda Picard; Martin Pollock; Kathryn Raymond; Carol Reesor; Ralph Ripley; Susannah Rowley; Samy Salloum; Laurie Sayer-Smith; Norma Scott; Dave Steeves; Marji Taylor; Nichael Tweel; Peter Ward; Wayne Wolfe; Elizabeth Ackman; Alex Beadie; Jocelyn Bennett; Christine Birnie; Kelly Bray; Kathy Briand; Vincent Calderhead; Taska Cariigan; Ken Clark; Steve Coughlan; Paul Davies; Les Doll; Kevin Drolet; Marian Fortune-Stone; Gavin Giles; Tim Hill; Chuck Hofley; Karen Hudson; Jay Humphrey; David Jones; Ann Keating; Susan Keswick; Mark Knox; Carson Lawrence; Herve LePierres; Mona Lynch; Neil MacLean; Louise MacPherson; Mike Madden; Donald Mathews; Lesley McKenzie; Alex Mersereau; Ann Mowatt; Clyde Nickerson; Paul O'Connell; Chris Parke; Gerry Parson; Nancy Peers; Dean Pietrantonio; Pam Reardon; Lynn Reierson; Jim Revell; Peter Rogers; Deveryn Ross; Cindy Rotar; Joe Spears; Jane Ann Summers; Tony Tam; Chris Van Dyck; John P. Wilkinson; Bois Wilson; and Nancy Wright arranged in several rows. Each person is holding up a sign with their name. 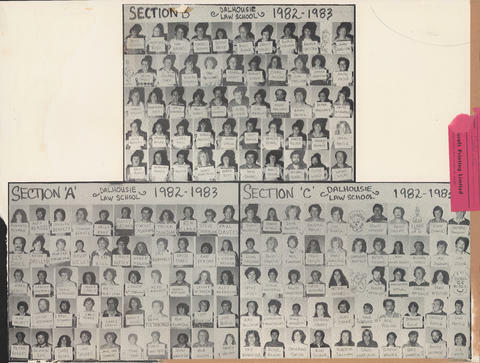 Students absent from the photograph are represented by doodles of people.